A child’s success is inextrica bly connected to the strength and resourcefulness of their family. Our team of family advocates helps families be advocates for their children and become self-sufficient. Social service support is provided to the families of all enrolled children. Social service staff help families assess family needs, develop strategies to meet those needs, access resources, and solve problems. 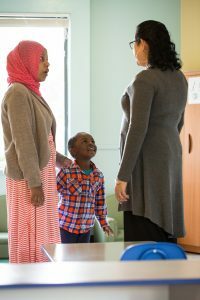 Our family advocates make regular home visits and help families find work opportunities, housing, childcare, subsidized food assistance, literacy and ESL classes, WIC, LIHEAP, and numerous other community services. It is our goal to link families to internal and external resources that will help them live more comfortable and less stressful lives. 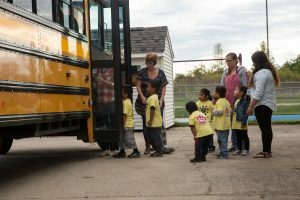 Bus service may be available for Head Start children enrolled in some classes at the Savoy, Urbana, and Rantoul centers. Service consists of bus stops within set geographical boundaries. We ask parents to provide transportation at all other centers; however, they may be assisted by participating in our carpooling program.